Love free stickers and animals? You’re at the right place! 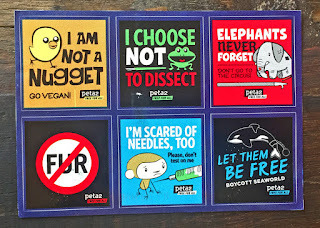 Fill out their form to order yourself some free PETA stickers and info on helping animals. And if you can't wait for these to arrive in the mail, print some out yourself and get stickin'! Note: Limited to one order per e-mail address every 30 days. At this time, orders can be shipped to the U.S., the U.K., and Canada ONLY. If you live outside these countries, check out peta2's FREE printable sticker sheets. Eliminate the wait and get on the street to promote animal rights ASAP. Print the pages in the link below onto full-page sticker sheets (you can find them at your local office supply store), and cut them out to make your own stickers. Lots of fun and no wait—how about that!